This stylish holiday home is located in Hastière, nearby Dinant in the Ardennes and offers stunning views of the Meuse valley. On a clear day, you can even see as far as France! 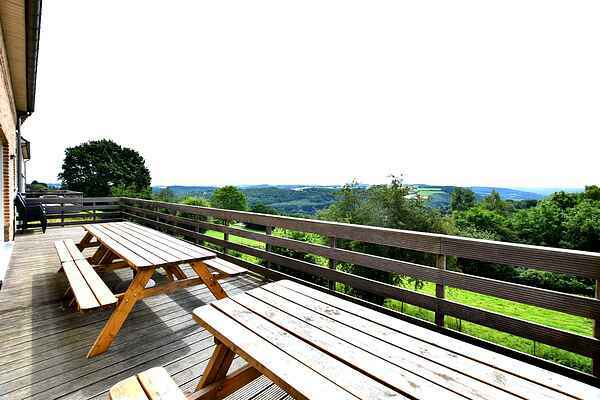 This spacious holiday home has all the luxury you may need and this, combined with the beautiful view, makes for a wonderful, relaxed and carefree stay in the Ardennes. The traditional hallway leads into the spacious and nicely decorated living room with a lovely lounge area. The French doors in the living room give access to the spacious terrace where it's great to sit in the sun and enjoy the view. Would you like to play a game of table tennis or maybe a game of foosball? You can find all this in the separate activity area! The surroundings of this holiday home offer plenty of options for walking, mountain biking, cycling, kayaking or cross-country skiing. Remember to visit the attractive small Saturday market in the town of Hastière. And of course, your itinerary should include a visit to Dinant (17 km) with its world-famous Citadel, France (within 10 km) or Namur (50 km). Thank you to respect the calm after 22h.